Another week and another high-profile hack – this time, the victim is Google CEO Sundar Pichai. His Quora account was targeted over the weekend by hacking groupOurMine, which also claimed credit for hacking FacebookCEO Mark Zuckerberg’s Twitter and Pinterest accountsearlier this month. 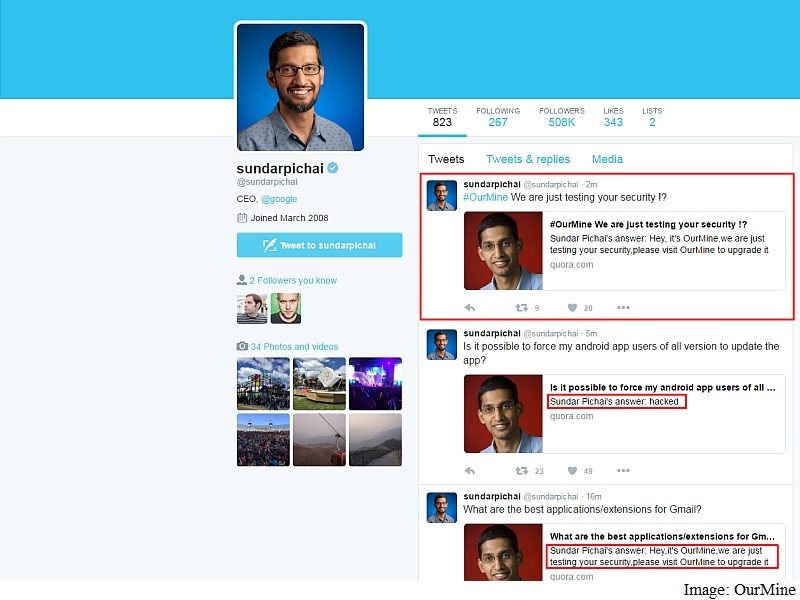 Both Pichai’s Quora and Twitter accounts have since been cleaned up, with no evidence remaining of a breach – however, a screenshot of his defaced Twitter profile was shared by OurMine. In a statement to The Next Web, the team said it had gained access to Pichai’s Quora account by a vulnerability on the platform. It said the vulnerability had been reported by Quora, but that the team had yet to get a response. The OurMine hacking group is eager to depict itself as a security firm, and advertises services on its site that scan websites, social media accounts, and companies for security vulnerabilities. Apart from Facebook CEO Mark Zuckerberg earlier this month, the team claims to have successfully hackedTwitter co-founder Evan Williams’ Twitter account, Spotify CEO Daniel Ek’s Twitter account, apart from Randi Zuckerberg and Channing Tatum. In the meanwhile, if you have an account on Quora, we’d advise you head over and change your password. Do ensure you don’t use the same password for other accounts, and follow security best practices for your primary email account – including two-factor authentication. Zuckerberg’s hack was reportedly due to his details being found in a leaked LinkedIn credential cache from the professional network’s 2012 breach.